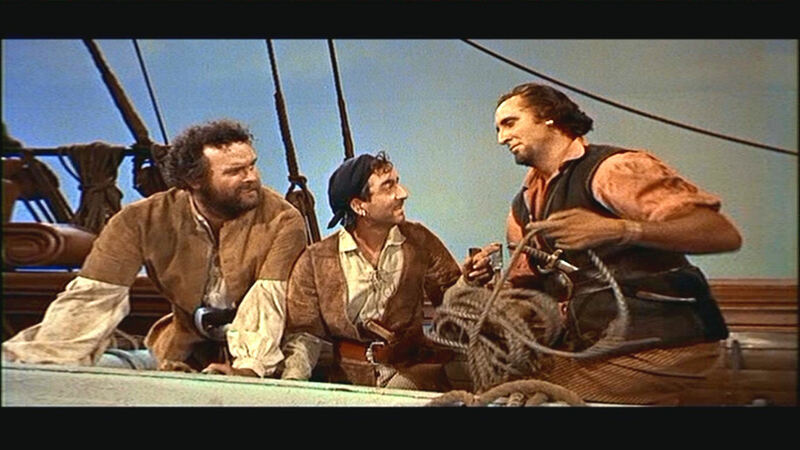 Today’s pic takes another look at Bert I. Gordon‘s children’s adventure tale The Boy and the Pirates (1960). Disgruntled pirate crew members Peake (Mickey Finn), Hunter (Than Wyenn) and Morgan do some plotting. Finn and Wyenn were busy character actors throughout the 1950s and 60s. They had both previously worked with Gordon, Finn in Earth vs. the Spider (1958) and Wyenn in Beginning of the End (1957). Wyenn was the more prolific of the two, working steadily until the mid-1980s. Finn’s credits end in the late 1960s; he passed away at the relatively young age of 55 in 1989. He turned up in an uncredited bit as a blacksmith in One-Eyed Jacks (1961). In spite of Gordon’s misgivings about hiring Timothy for the role of Morgan, I do believe Tim was born to play a pirate. This entry was posted in Film and tagged beginning of the end, bert i. gordon, earth vs. the spider, mickey finn, one-eyed jacks, than wyenn, the boy and the pirates, timothy carey. Bookmark the permalink.